Marvel's megalomaniacs' maniacal mayhem must- read! Nuff Said! Roy Thomas (GS 1+2) largely offers a two-issue argument as Doom and Namor try to convince each other to work together. I actually liked the first issue (which was a frame for reprints) better than the second. That was because the reprints (Submariner #20 and some issue of FF) were nicely constructed tales. In contrast #2 was simultaneously overly stretched to fit the longer length of the Giant-Size issue and overly abrupt in getting to its main story of an android rebellion [5/10].Early Days (1-4). Four issues with three authors doesn't bode well, but the first three actually read quite well. Tony Isabella continues plots from the cancelled Sub-Mariner comic, then Jim Shooter finishes it off nicely. There are some good moments of pathos and shock that both draw us toward and away from our villains [6+/10]. Unfortunately Bill Mantlo caps things with a fourth issue where Doc Doom and Namor decide to fight and break up. Again. There's something about Deathlok that makes little sense without context, and overall the issue is a bore [3/10].Steve Englehart (5-8). Englehart really changes the feel of this comic. Before it was what it's name promised: a super-villain teamup. As such, it was a very unique book. Here, the Fantasy Four tread heavily in the pages, and the book falls into the more comfortable hero-villain dynamic of most of Marvel's comics. Still, there are some nice elements, particularly the intro of the Shroud (at least, he's nice if he's intended to be hilarious camp, and I think he is). Meanwhile, Englehart returns to classic elements of Hydro Base and the Hydro people, and it's nice to see those plots advance [6/10].The Avengers (9 + A154-156). Another four issues with three authors: Gerry Conway, Jim Shooter, and the new SVTU author, Bill Mantlo. Clearly, this continues the superheroification of SVTU, but it's not a bad story, as the Avengers stumble into a conflict between Doc Doom, Subby, and Atuma that none of them understand ... which is sort of delightful. The last issue by Shooter is weaker than the Conway or Mantlo issues and focuses on lots of punching, but there's fun deviousness before that [6/10].The Red Skull (10-12). Bill Mantlo's first solo work on SVTU is ... unfortunately not very inspiring. It's great to have a new villain, as the Doom + Subby dynamic was getting dull. But this story is a pretty dull fight with Cap, Doom, and Shroud facing off against the Red Skull. I think the boringness of Mantlo's Skull really says it all: he's not able to take advantage of the interesting characterization introduced in Englehart's short reign [4/10].Finale! (13). The final team-up between Doom & Sub-Mariner is nice mainly because it ties up plot threads going back years. The story itself is largely pedestrian fighting [6/10].Magneto (14 + Champions). Sadly, these issues show how SVTU really lost its way. They're all about Magneto facing off against Doom in a totally normal hero-versus-villain way, and they also inundate the comic with yet more heroes like the Avengers and Champions. Worse, it's a pretty meh story after all that [3/10].Nazis (16-17). These last issues by Peter Gillis tend to recover what SVTU lost. They're about villains interacting with villains and living in their own ecosystem. It's great to see a truly repugnant Red Skull and the unveiling of the Hate Monger. There are times when the storytelling is clumsy and the pacing feels off, but I'll forgive that for the unusual sort of story that Gillis was telling [7/10].Overall, Super-Villain Team-Up never fulfilled its promise. 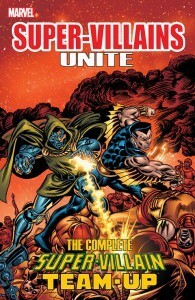 There were times when it stood out as something truly unique, but then the Avengers or the Champions or the Fantastic Four blundered in and turned it back into a much more traditional title. In addition, the revolving door of creative teams constantly muddled the plots, often moving major plotlines off to the periphery for no good reason. The loss of the Shroud + Doom plotline mid-book is the most obvious, but it was an ongoing problem. This collection was interesting to read as a piece of historical ephemera, but it probably won't remain in my library. Roy Thomas Tony Isabella Jim Shooter Bill Mantlo John Buscema Mike Sekowsky George Evans Sal Buscema - Roy Thomas is a comic book writer and editor, and Stan Lee's first successor as editor-in-chief of Marvel Comics. He is possibly best known for introducing the pulp magazine hero Conan the Barbarian to American comics, with a series that added to the storyline of Robert E. Howard's character and helped launch a sword and sorcery trend in comics. Thomas is also known for his championing of Golden Age comic-book heroes — particularly the 1940s superhero team the Justice Society of America — and for lengthy writing stints on Marvel's X-Men and Avengers, and DC Comics' All-Star Squadron, among other titles.